If you’ve visited my blog recently, you may have noticed that I’ve been crazy about making some traditional summer authentic Chinese dish recipes, such as Moogoo gai pan recipe or szechuan mapo tofu recipe. Frankly, I like to be an early-starter. Even with my food preparation. If you run out of summer outdoor barbecue ribs recipes, wonder what’s the best meat for grilling, or want to try honey barbecue sauce recipe, you’ve come to the right place! 1.Mix 2 tablespoons soy sauce, some salt and black pepper in a medium bowl. 2. Cut lean beef into 2cm cubes. 3. Marinate beef cubes in the bowl (step 1). Chill in the refrigerator for at least 2 hours. 4. 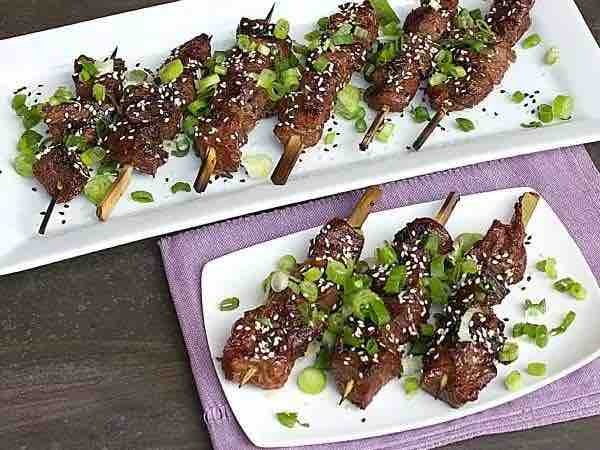 String beef cubes to bamboo sticks. 4. Grill beef skewers over high heat for about 5-10 minutes until cooked. Sprinkle chopped green onion and sesame seeds. Enjoy! 1. String shrimp and lemon slices alternately together in a bamboo stick. Sprinkle salt, garlic powder and black pepper. 3. Grill over medium heat for about 10 minutes until shrimps turn red. Add some lemon juice on top and enjoy! 1. Mix all seasoning together in a bowl: chopped garlic, ginger, 1 tbsp honey, 1/2 teaspoon lemon juice, 1 tbsp vinegar, some salt and black pepper to taste. 2. Marinate chicken in the sauce overnight in refrigerator. 3. String mango, onion, zucchini, bell peppers and chicken breast alternately to bamboo sticks. 3. When ready to cook, add some olive oil on the chicken wings and grill over medium heat for 5-10 minutes. 1. Remove the root of asparagus, and then split into two. Put some salt in the boiling water, add the asparagus and crab stick and cook for one minute. 2. Marinate bacon for 10 minutes with black pepper. 4. Divide bacon into half. Roll up cheese, asparagus and crab stick and fixed with a toothpick. 5. When all the asparagus bacon rolls are ready, grill over medium heat for 5 minutes or so. Enjoy! 1.Mix all ingredients in a bowl: 1 tbsp oyster sauce, 1 tbsp soy sauce, 1 tbsp honey, 1 tbsp chili oil, 1/2 teaspoon cumin powder, 1/2 teaspoon black pepper, 1/3 glass red wine and some salt to taste. 2. Wash chicken wings for several times. Use a knife to lightly cut the front and back of the chicken wings. 3. Cover the chicken wings with the mixed sauce prepared in step 1. For best results, marinate for at least 5 hours. 4. Grill over medium heat for 10 minutes or so and enjoy! 1. Cut veal ribs to dices (about 3cm × 3cm). 2. Add seasoning and marinate for 30 minutes. 3. String veal ribs, mushroom, tomatoes, green peppers and onions alternately to sticks. 4. Grill over medium heat until cooked.